Nothing says summer comfort like Peach Cobbler. And nothing says peach cobbler like Grandma’s classic recipe. 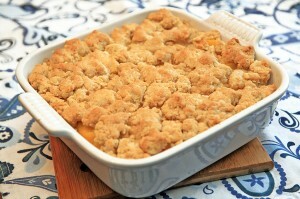 This peach clobber was, is and will always be a family favorite. Handed down from Tinsley’s grandma, this dessert has become a summertime cookout staple. Everyone loves it and begs for us to make it. We have even received requests for his during the holidays – it’s that good. Let this recipe become one that’s handed down for your family. Preheat the oven to 400. Grease a baking dish Add all ingredients above to a medium prep bowl. Toss to combine, ensuring all the peaches are coasted. Pour into the prepared baking dish. Add Bisquick and sugar (3 tbsp.) to a food processor. Pulse to combine. Add in cold butter and pulse until mixture looks like coarse crumbs. Add milk and pulse until a batter forms. Drop heaping spoonful’s of biscuit mixture on top of peaches, covering them completely. Sprinkle leftover sugar. Bake 25 to 35 minutes or until golden brown. Allow to cool slightly before serving, giving the liquids from peaches time to tighten up. The peaches seem to “juicy” use a turkey baser to remove some of the excess liquid. Serve with fresh whipped cream.